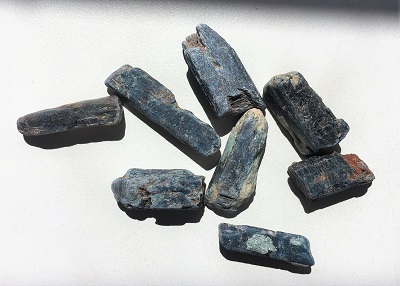 Rough natural deep blue colored Kyanite specimen from Africa. Rough natural deep blue colored Kyanite specimen from Africa. 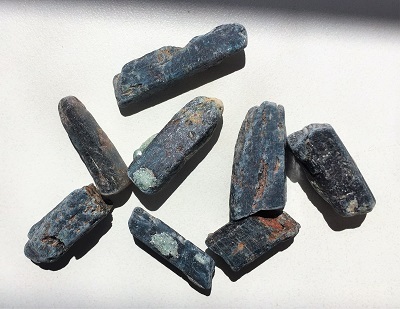 Blue Kyanite crystals create energetic pathways of connection for emotions, mental activities, and learning experiences. Blue Kyanite is a wonderful overall crystal tool as it does not hold negativity and does not require cleaning or clearing. Blue kyanite may be helpful to one to process through confusion, dispel blockages, release feelings of anger, frustration and stress. 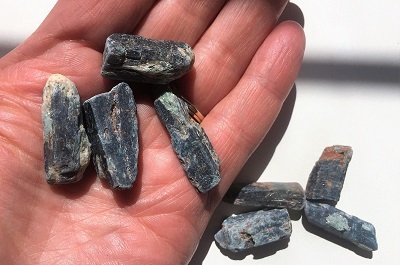 A stone of vision, blue kyanite stimulates psychic abilities, intuition, deepens meditation and enhances one's ability to download information from higher sources. Blue kyanite crystal connects to spirit guides and resonates with divine energies. Blue kyanite may also facilitate dream recall and promote healing dreams. Blue kyanite may be supportive for in hospice and preparing to make transition through death. In healing, blue kyanite aligns the chakras and subtle bodies, clearing pathways and meridians. Blue kyanite is a natural pain reliever and assists nerves and tissues heal energetically and physically from trauma. Blue kyanite may be helpful to lower blood pressure and heal infections. Blue kyanite may be helpful in the treatment of muscular disorders, the urogenital system, thyroid and parathyroid, adrenal glands, throat, and brain. Blue kyanite supports the cerebellum and the motor responses of the body.